Now, I'm not a lover of football. Well, strictly speaking, that's not entirely true. There is the personal appeal of grown men wearing tight(ish) shorts, getting sweaty and muddy, whipping their shirts off at the end of a game and then having communal baths. But, I digress. The tale of one of a kind football manager Brian Clough, who even made an impression on my teenage self more interested in the next episode of Doctor Who that used to follow rapidly on from Grandstand and Basil Brush, is not one I would normally consider as an enticing cinema experience. However, this is an adaptation of the David Peace book, a writer I'm swiftly catching up with, and growing to admire, after seeing the recent Channel 4 television adaptation of his Red Riding trilogy, it's scripted by Peter Morgan, fresh from his success on The Queen, and it's another chance to watch one of the most exciting actors of his generation, Michael Sheen, weave his spell. I went into the film with few illusions. I suspected the rivalry between Clough and Don Revie was painted in much darker hues in Peace's book and that we wouldn't perhaps get the darker, brooding presence of the man in the film. Essentially that's true. 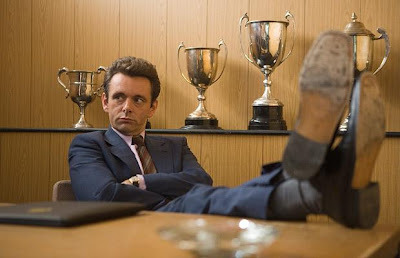 Sheen plays up the rogue with the one liner for every occasion and his portrayal shifts more towards Clough's status as a showbiz icon of the 1970s and 1980s and his legendary egomania and blunt sense of humour. It is patently clear even to me that he shouldn't have succeeded Revie as manager of Leeds as the film chronicles Clough's slowly disintegrating relationship with the team. Like Morgan's The Queen it's a film that blurs the boundaries between what may be fact and what may be fiction, just as Peace's original novel apparently does, and it obviously takes some poetic licence with the story and certain characters. 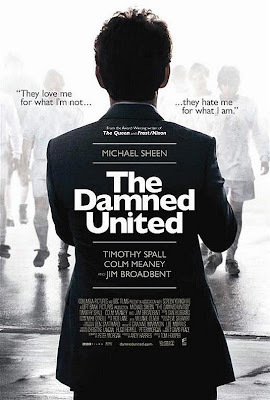 The triumvirate of Sheen as Clough, Timothy Spall as his talent spotting tactician Peter Taylor and Colm Meaney as thorn in his side manager Don Revie, all superbly realised performances, are enough to keep anyone entertained. 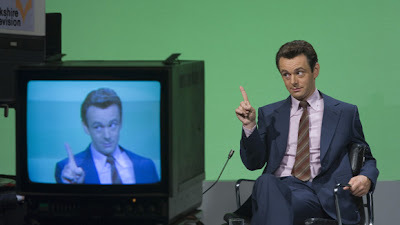 Sheen captures Clough's vocal inflection and facial mannerisms wonderfully well and Spall, bearing little likeness to the actual Taylor as demonstrated in the archive footage that closes the film, matches Sheen's performance, particularly in the bitter row they have whilst on holiday in Majorca which is also a visual high point in the film as director Tom Hooper shows them as tiny figures in a landscape moving further and further away from each other. It is in effect the story of a marriage between two, or indeed three, men, its shocking toll on Taylor particularly, and the bitter obsession that Clough has for bettering Revie's track record, his bloody mindedness that leads to self-destruction. In the middle of this love triangle there is also great support from the ever reliable Jim Broadbent as Chairman of Derby County, Sam Longson, who finally ensures that Clough is hoist by his own petard. The structure of the film might annoy some as it flips between Clough's rise at Derby County and his demise at Leeds but if you're a fan of the current vogue for all things 1974, like me, then the plethora of archive football coverage and mock interviews with Parky and Austin Mitchell, the test card, the Yorkshire Television logo and John Craven will push all the nostalgia buttons. The final dramatised interview by Mitchell with Revie and Clough together, of which I've now seen the actual version, doesn't really capture that edge of your seat tension between two men who simply refuse to give ground to each other. It certainly shows that Clough is made far more palatable as a character in the film than he was in life. I'm not really able to comment on director Tom Hooper's handling of the football scenes, apart from the fact that he's able to demonstrate how different matches of the 1970s are in comparison to those of today. Lots of outrageous fouling and cheating ensued according to this tale. I was somewhat distracted by the actor playing Billy Bremner. Now, I do remember Bremner and unfortunately here he seems to be played by a small man in a terrible bubble perm wig and bears little resemblance to the figure I can recall. The individual players don't really get fleshed out and merely become cyphers in the story so I think it's best to let the football scenes wash over you and just enjoy Clough's rags to riches to rags story and his sheer nerve in telling the Leeds team, "Chuck all your medals and all your caps and all your pots and all your pans into the biggest dustbin you can find, because you've never won any of them fairly." As entertaining as it is, and there is real vulnerability in Sheen's performance too, you are left wondering just how much of this is true, how much of Peace's novel is fiction or fact. Clough's son Nigel, Joe Jordan and others have pointed out the fictions presented in both book and film and I'm sure Johnny Giles, who successfully brought a legal case against David Peace, won't be rushing to see this.